So I’ve had blogging on my to-do list all week and failed to check it off… I shall strive for betterment in that department. Meanwhile, other bloggers are sharing brilliant tips that I am carefully cataloging for future use. 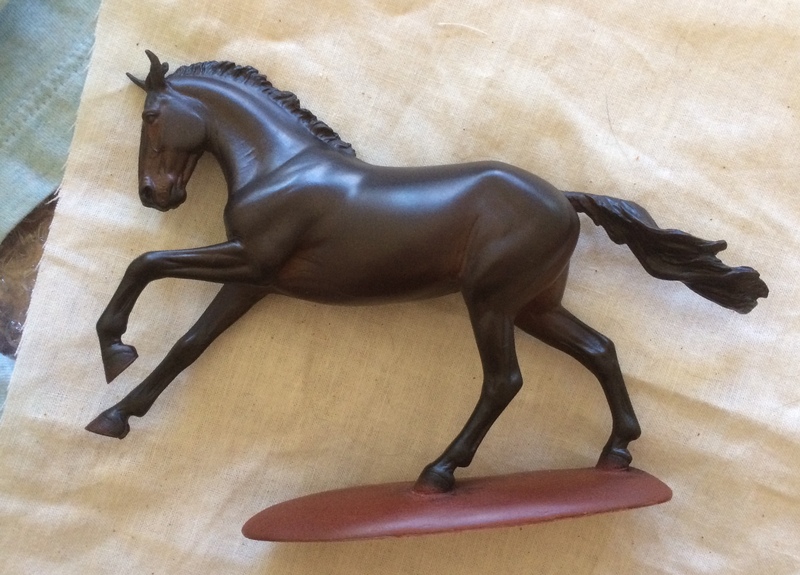 I have been keeping my tutorials page more or less up to date, and trying to organize and list all of the best model horse tutorials out there. Two of my most recent additions are particularly awesome and deserve special notice. 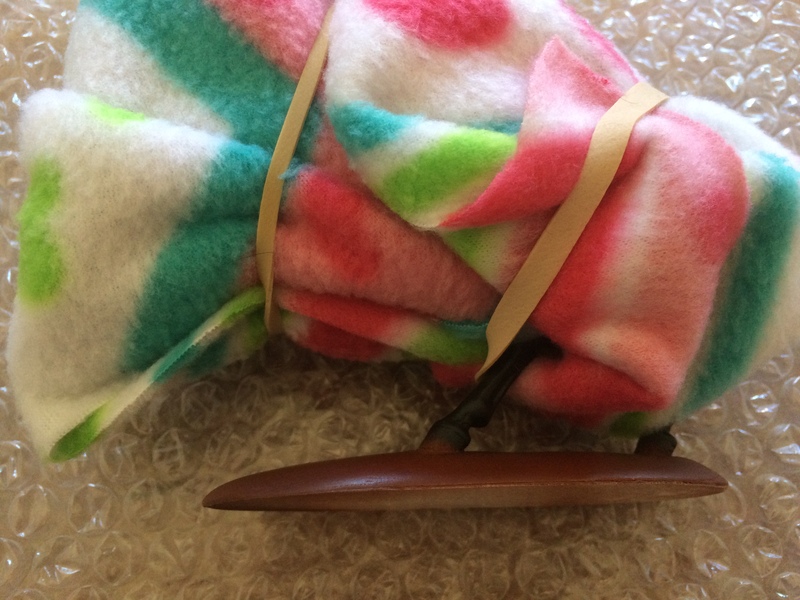 The first is a DIY English stirrup tutorial from Ebb&Flow Studio. This tutorial is both simple and brilliant. The finished products look realistic and lovely, and are made out of simple materials that most hobbyists probably already have on hand. 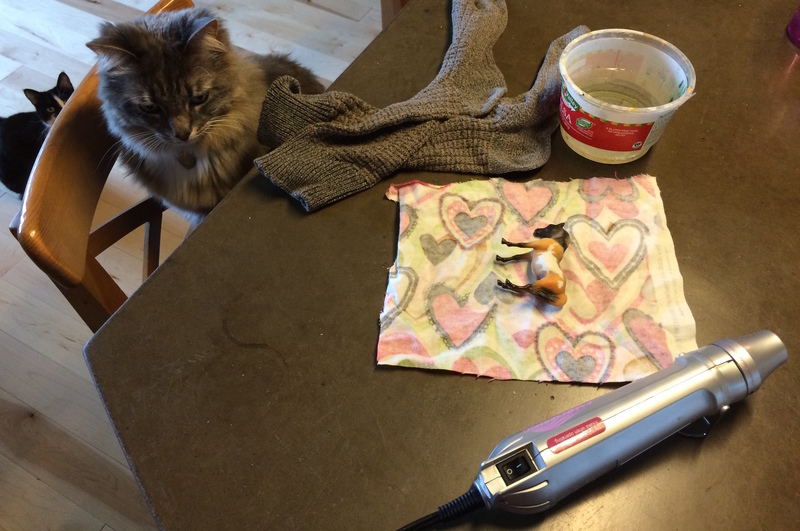 I both rejoiced and cursed inwardly when I first read this tutorial- it was only a week or so earlier that I finally caved and bought cast stirrups! I am going to NAN this coming year (more on that in future posts!) and I need a new English set for Nightfox. I’ve been making my own stirrups, but I decided to pull out all the stops for my NAN debut. 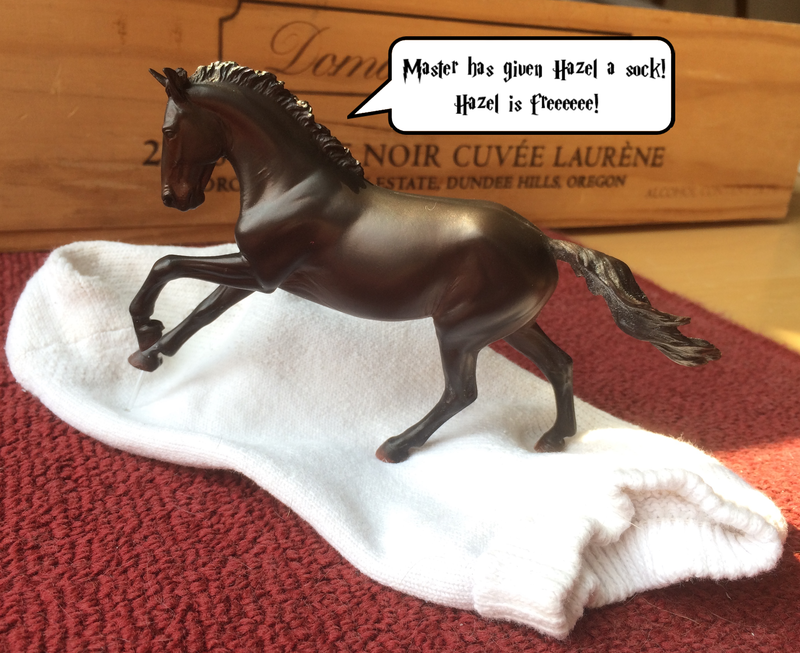 (After re-reading Dreamflite Design’s stirrups review, I went with the Horsing Around ones). But I definitely plan to use the Ebb&Flow tutorial for future projects! Nightfox in English at NW Congress. Lots of things to improve before NAN! The second tutorial that rocked my world this week is from Grace Ledoux (Stage Left Studios) by way of Anna Kirby of Dreamflite Design. Back in 2012, Anna wrote a lovely little tutorial about cutting lace for mini tack. She showed how she used double sided tape and a metal ruler to get very thin, very straight lace pieces. At the time, I was not making much tack and was not that motivated towards this kind of perfection. My loss! I’ve struggled in past tack projects with getting nice pieces of lace, especially getting consistent widths of narrow lace appropriate for mini tack. When I saw Grace’s lovely thin straps at Sweet Onion, I was re-inspired and she said that Anna’s method was the secret to her lace. Then, last week, she posted a video tutorial showing the method. 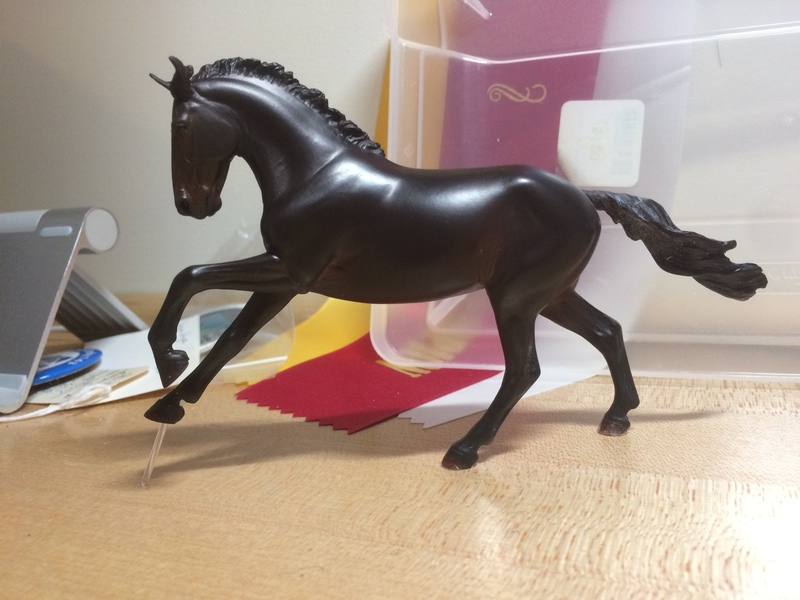 I am so looking forward to using this method for my next tack project! 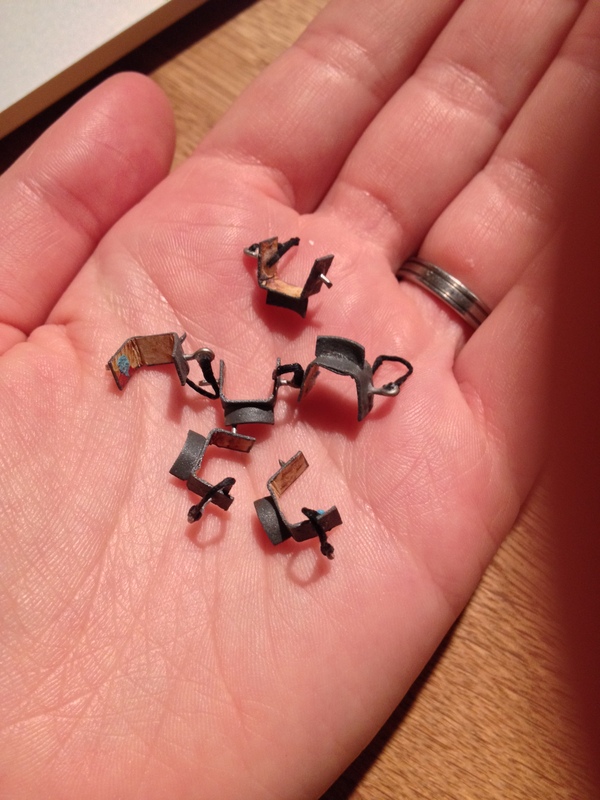 Teeny beautiful straps will be mine! Since I’m showing a different horse in performance at the next show, I need a different jump set up. Previously I had made jump cups and glued them to my standards- but that only allows one height of jump. I like my props to be as flexible as possible so they can be used in lots of different combinations. So I set about to make a new set of jump cups that could be reused and repositioned. And I took pictures so I could share the process. Do note that this tutorial is only for the jump cups, not the standards. I’m using my lovely standards from Mountain Home Models. 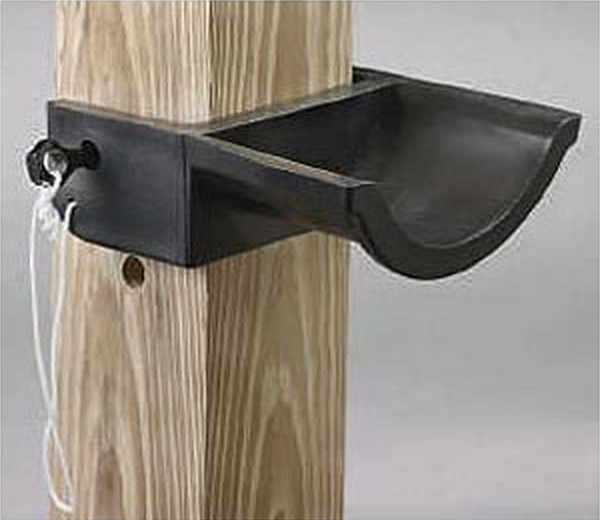 You can make your own with hobby wood, glue, and patience. 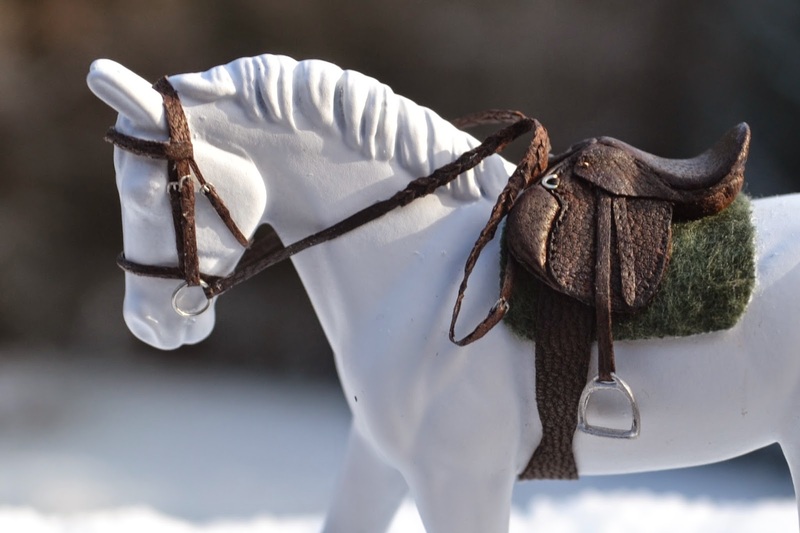 This tutorial is for stablemate scale jump cups, but could be adapted for other scales. 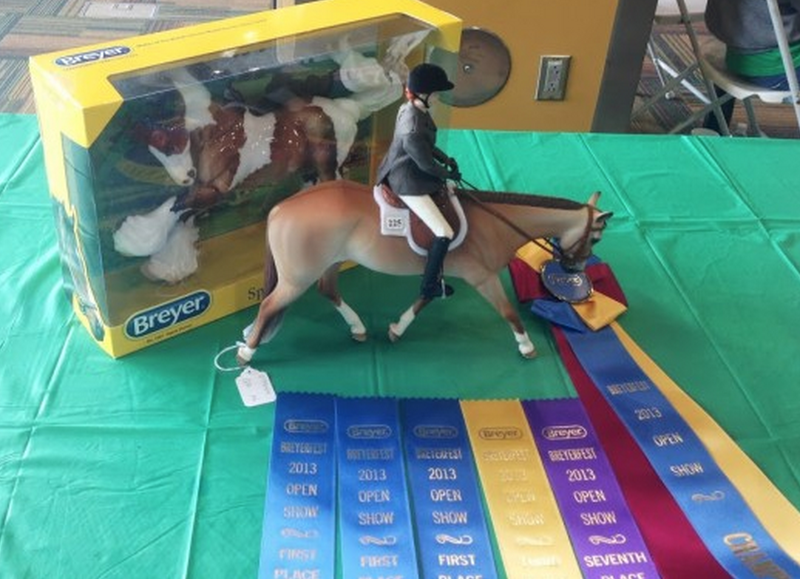 If you’re making a traditional scale jump, I recommend that you check out this post on home made jump cups from Jennifer Buxton of Braymere Custom Saddlery and this jump cup tutorial from CK Tiny Tack. 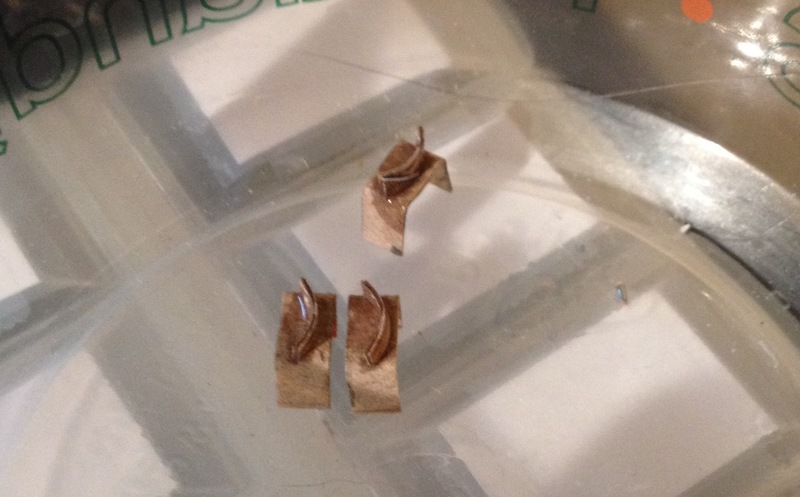 You’ll also need a pair of small pliers and a wire cutter. The first step is to cut your cardboard. For lack of better terminology I’m going to refer to the part that grips the standard as the wrapper. You the wrapper to cover three sides of the standard, or very close, just like in the picture of the real jump cup above. 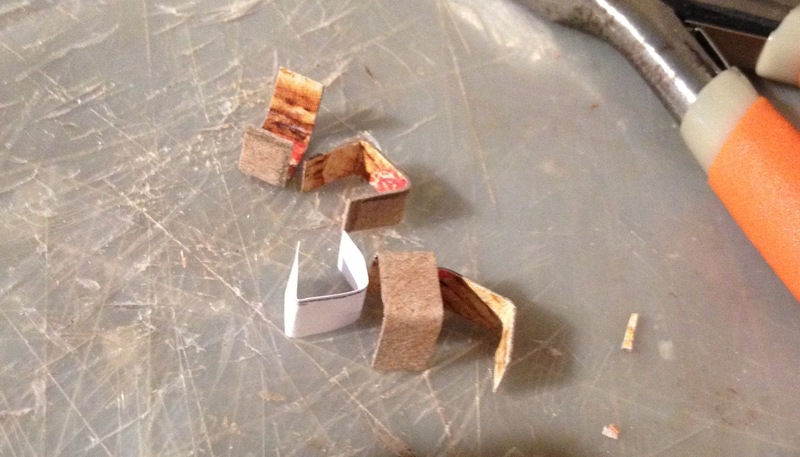 You’ll also need to cut a thinner piece to form the actual cups. This piece should be roughly the width of one side of the wrapper. Gently bend the strip around something round (for best results, use your jump poles) so that it forms the cup shape. Use super glue to attach the bent cup to the wrapper. Bend or trim the cup as needed so that the edges are within the width of the wrapper. Set the assembled cups aside to dry thoroughly. Next you can paint your cups. Jumps cups are commonly black, white, or silver, but they can come in pretty much any color you can think of. I went for the classic metal look, which I achieved with a mix of dark grey and silver. 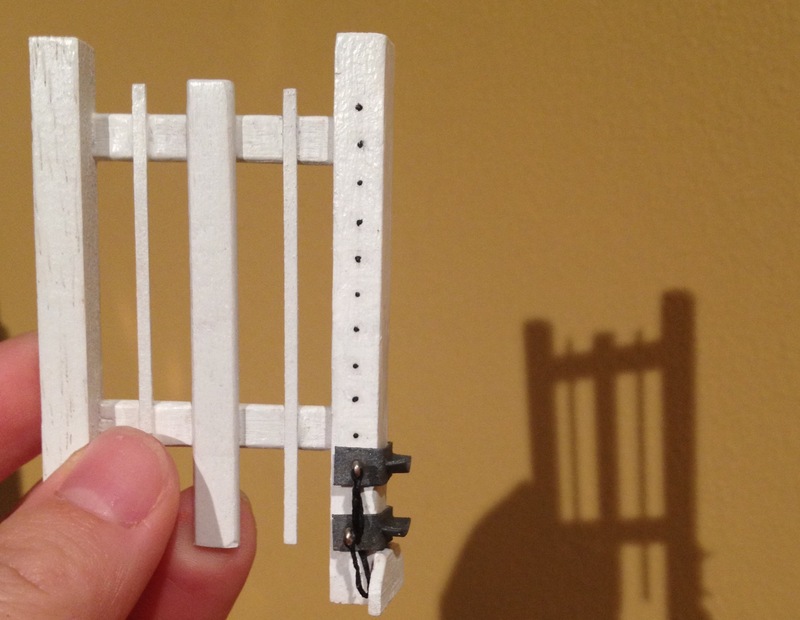 Leave the inside of the wrapper unpainted- this will make it easier to use later. But don’t forget the edges of the cardboard that will still be visible. Next we start making the pins. In this scale, the pins don’t actually go through the standard to hold the cup on- they just look like they do. 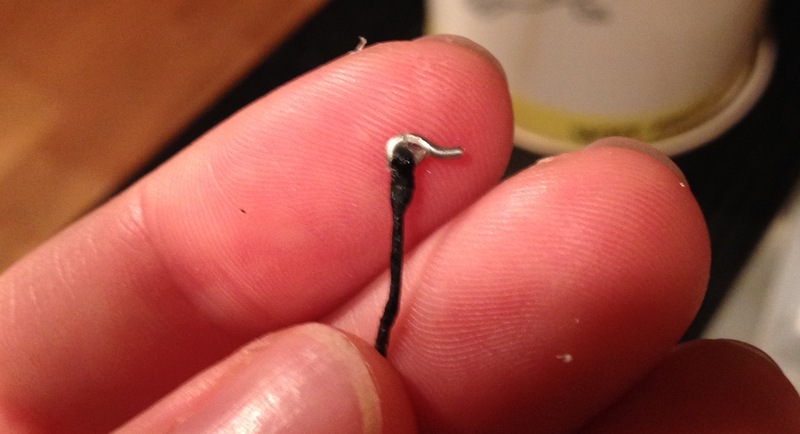 First, bend you wire to make a tiny hook. Loop your string through the hook and hold it there as you bend the hook shut to form a loop. Next, bend the wire coming off the loop so that it is straighter, like below. 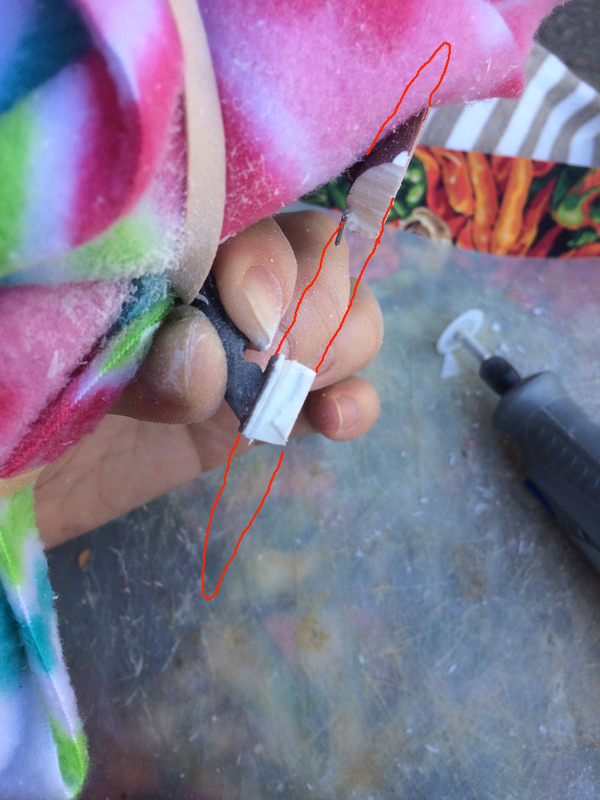 Glue the string to itself to attach it, and make sure it falls at a 45 degree angle to the pin. 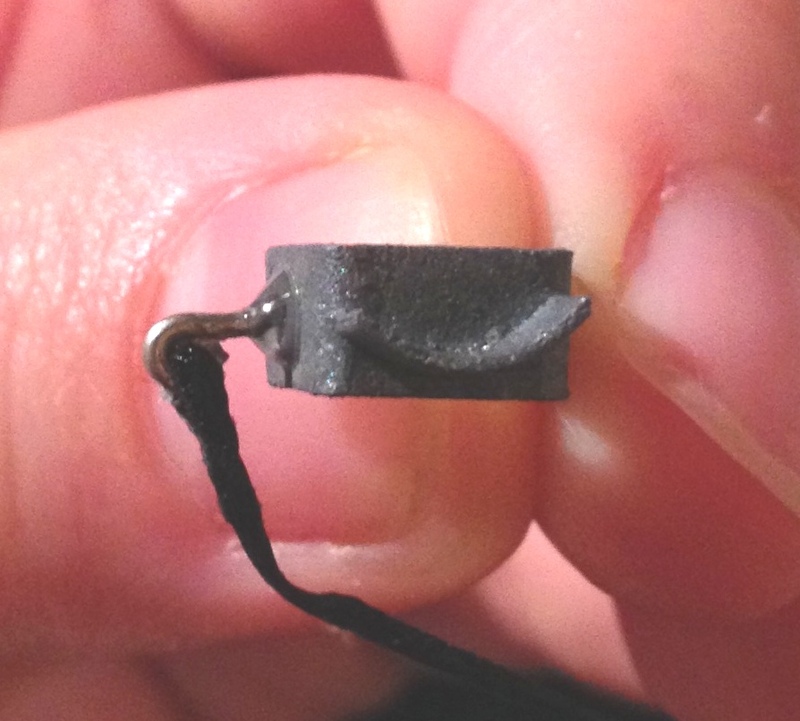 You can then trim the excess wire- the pin only needs to be a few millimeters long. Then, attach the pin to the cup. 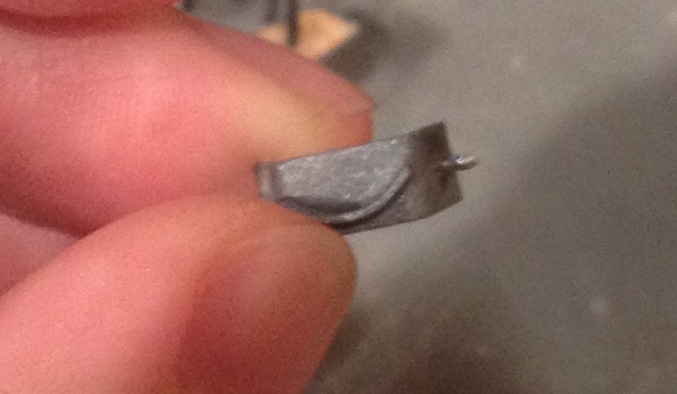 This is tricky with such tiny pieces and the super glue, but don’t get discouraged if it takes a few tries. You make need to adjust the pin as it dries so it comes out of the cup straight- in the picture below it is slanting down too much. Wait for that glue to dry thoroughly before the next step. Carefully, without putting stress on the pin, bend the string around and glue it to the inside of the cup. Avoid making it lumpy as that will make the wrapper not fit your jump standard. 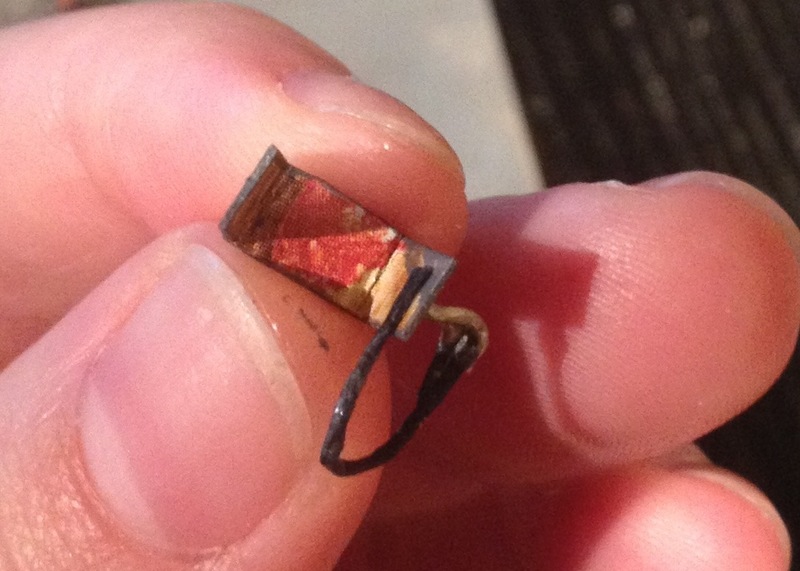 To show the pin coming out of the other side of the cup, glue a tiny scrap of wire to the other side of the cup. Again, you want to make sure it is perpendicular to the wrapper. Let that dry and voila, jump cups! 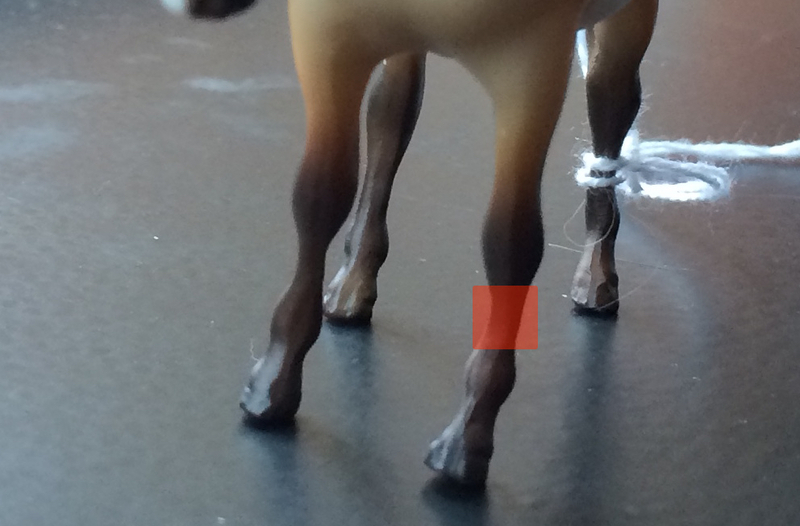 I recommend that you make extras, just in case a pin pops off right before your jumper class. To affix your jump cups, just use sticky wax (the same kind you use for bits and such) on the inside of the wrappers and mold them onto the standard. Since they come on and off, you can adjust the height of your jump and make different pole combinations. Here’s my jump all set up with a low obstacle and my new jump flags (toothpicks, cardstock and paint). I left this set-up on the shelf overnight and neither the sticky wax or the jump cups failed. Jumps are super fun to make because the combinations are endless and you can get very creative. I hope this tutorial was helpful for some folks out there making mini jumps. Got questions? Just ask! 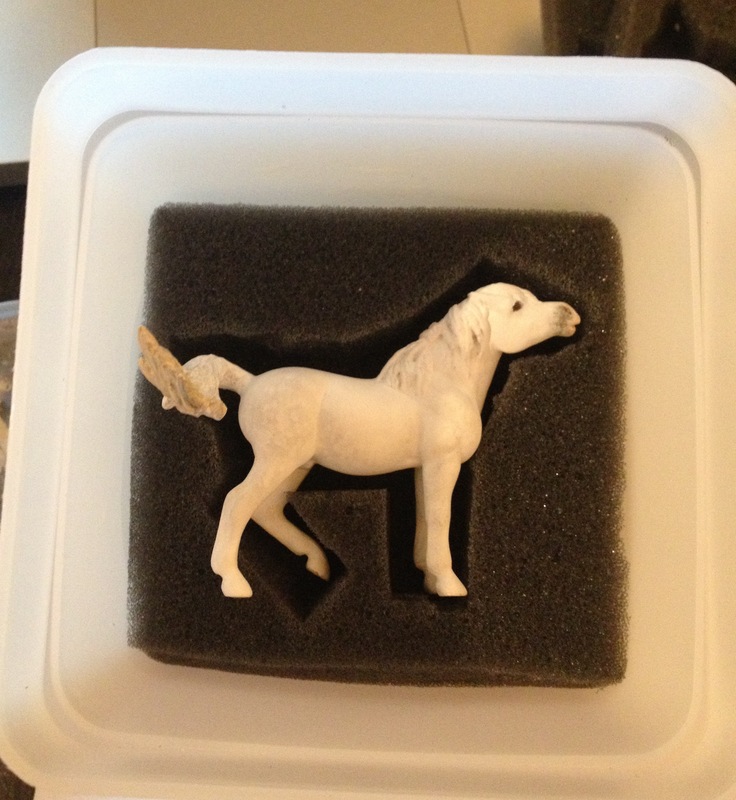 One of the extra little projects I managed to finish before Rose City Live was making a custom travel case for Alpo, my breakage-prone pony. He arrived at last year’s RCL with a broken tail and has been repaired and repainted three times since I made him in 2012. I’d like this time to be the last! One of the things that makes Alpo prone to breaking is his tail, which is turned and swished. That makes the tail extra fragile. 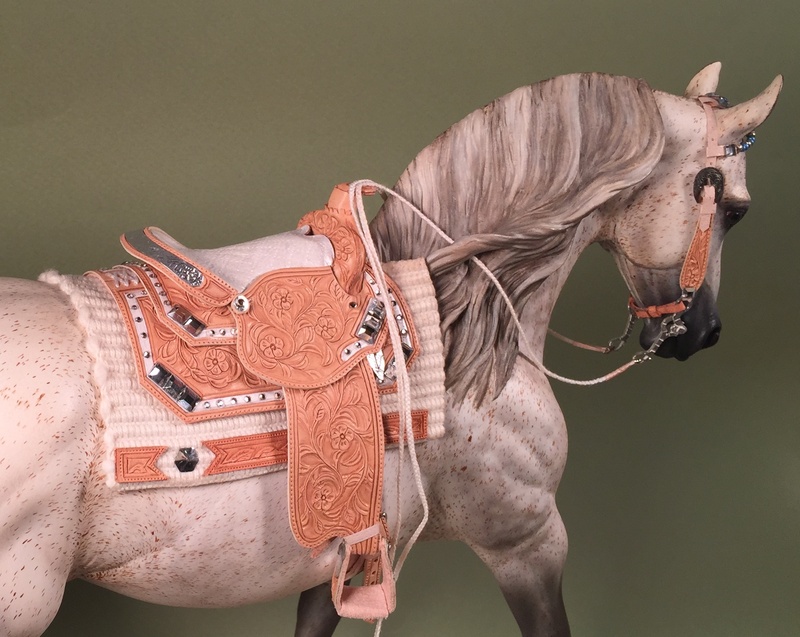 Horses with thin pieces that stick out like swished tails, long ears, or flying manes are all good candidates for custom carry cases. I took pictures of my process to share with you. My carry case was heavily inspired by Emily Rodger’s tutorial, published on the Braymere Custom Saddlery blog. 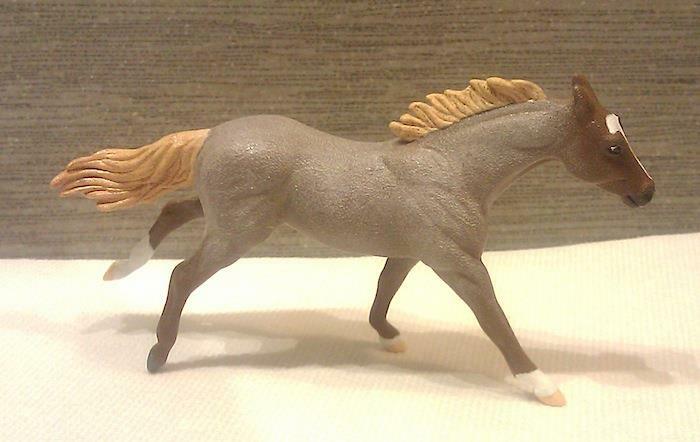 My version is adapted a bit for stablemates and a smaller budget. 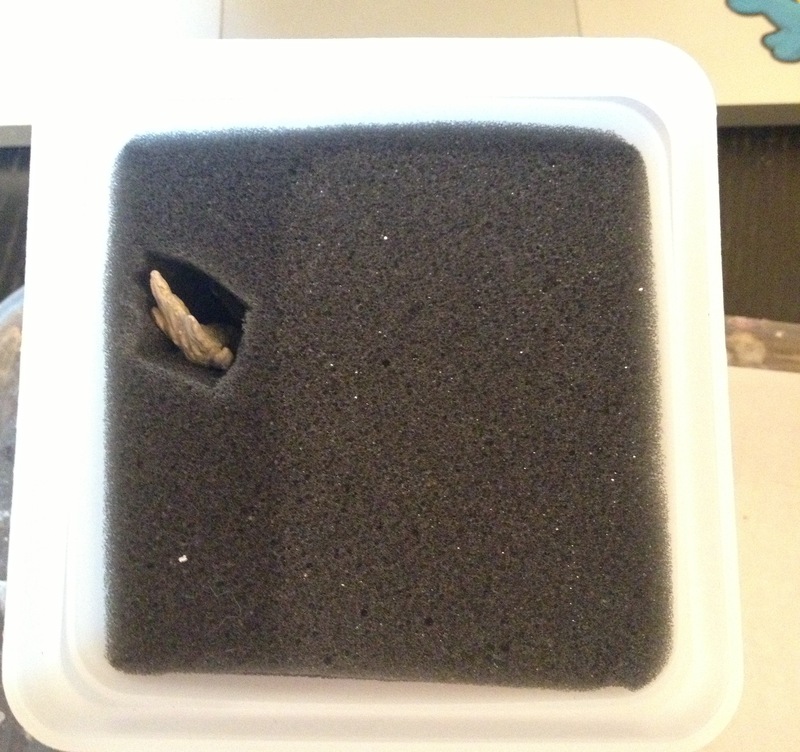 Because my container was deeper than needed and I didn’t want to waste precious foam, I first filled the container up part of the way with styrofoam. 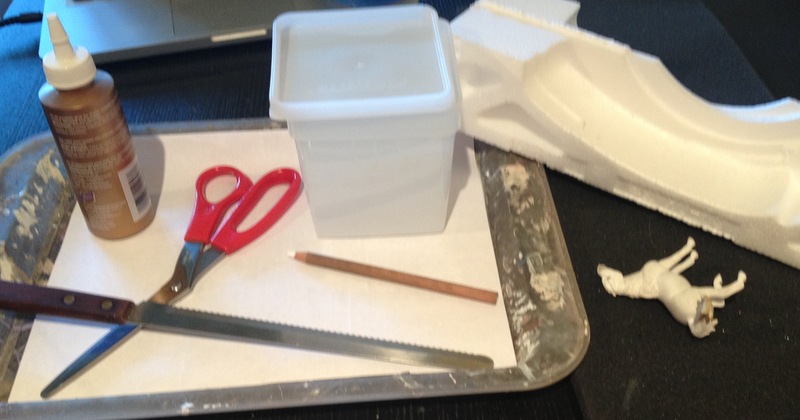 I cut the styrofoam carefully to take up the space needed and glued it in place. 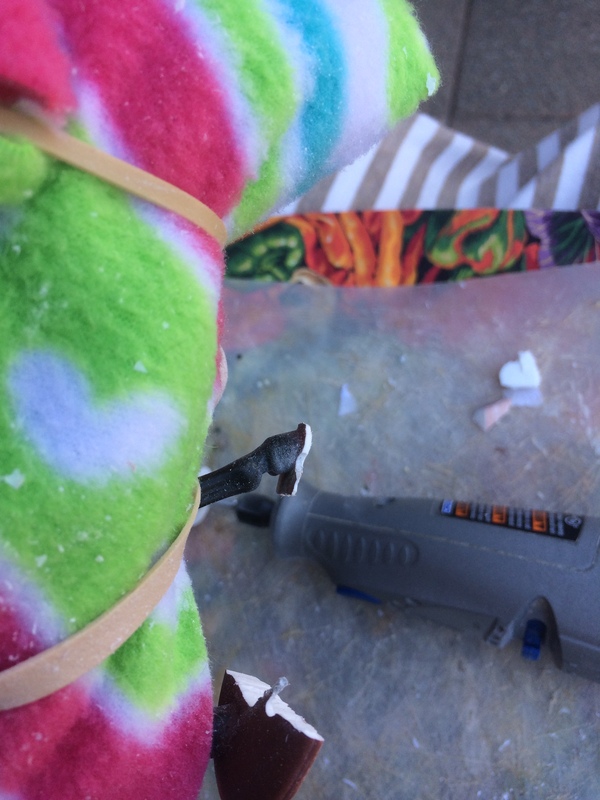 Cut out and glue down a layer of the cushy foam (you could certainly add multiple layers, especially for larger models). 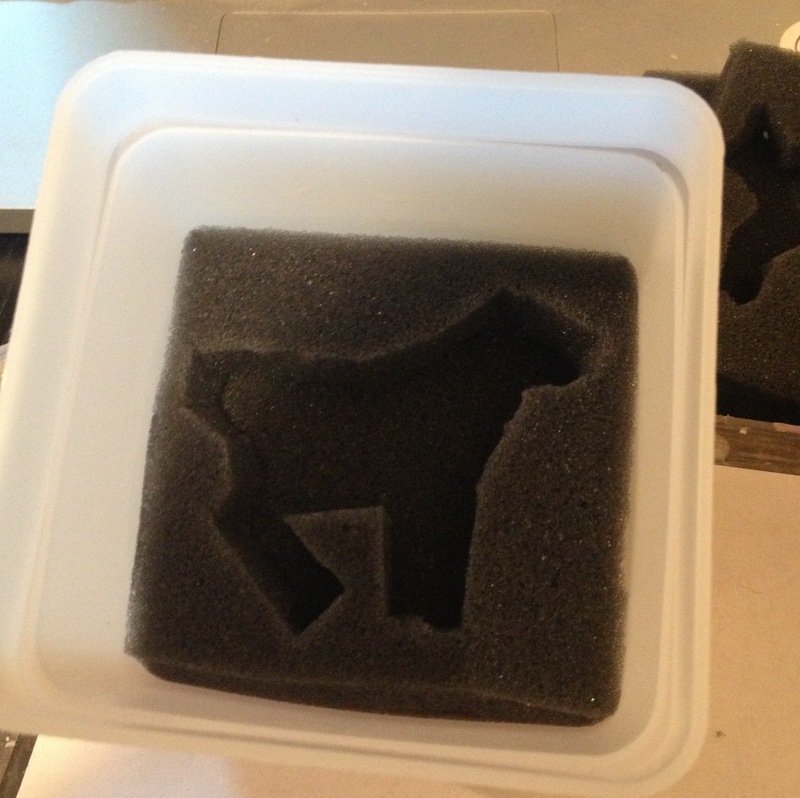 Cut a second square of foam and carefully traced around the model with the charcoal pencil. You want to leave a little bit of breathing room but still provide the secure custom fit. After tracing, cut out the shape. Now take another square of foam, and trace the shape of the first cut out on it. With your model lying in the first cut out, identify which part(s) of the model stick out- that’s where you’ll need to cut for the second piece. 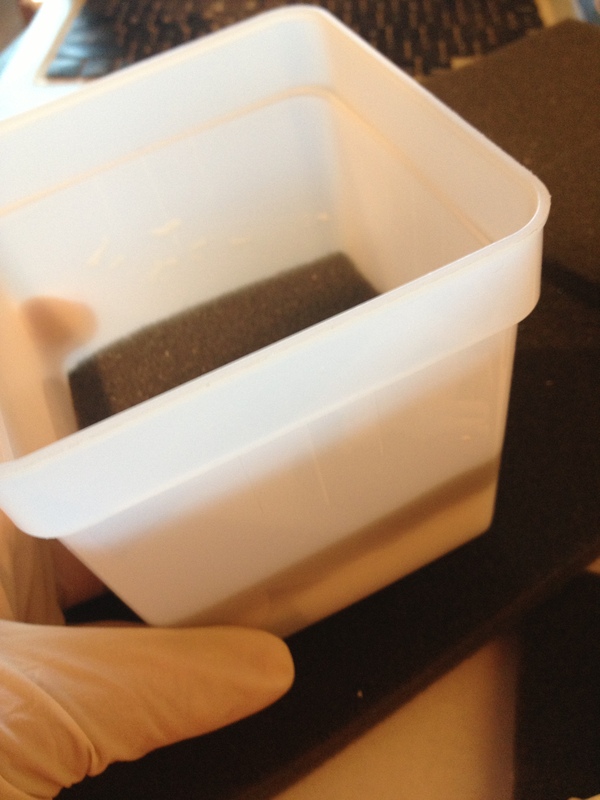 This step will depend a lot on your model and the thickness of your foam. 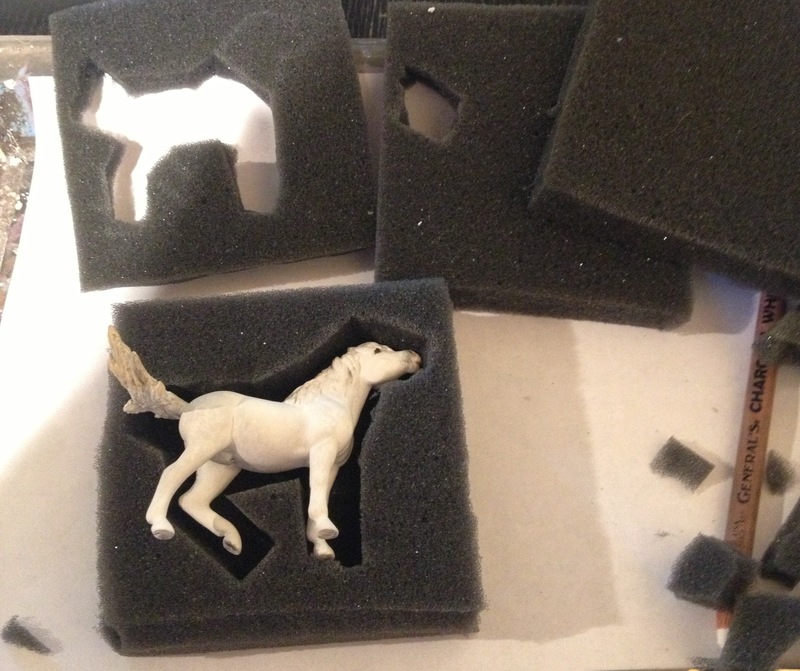 After tracing the first shape onto the foam and comparing, I could see that Alpo’s raised hind leg and head were both lower than the edge of the foam. 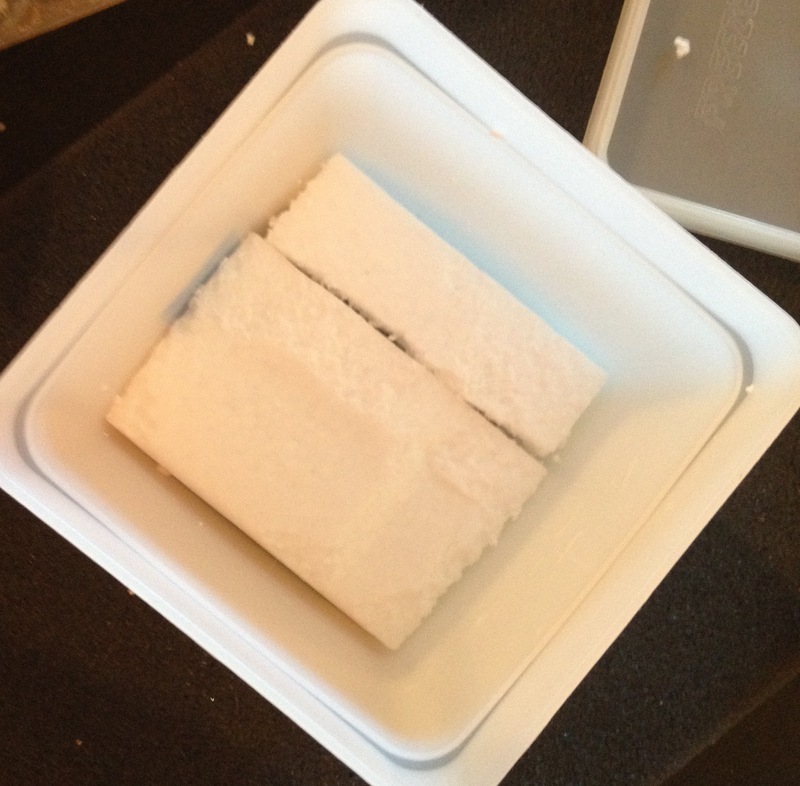 The second piece of foam would completely cover those parts, so I did not cut space for them. For Alpo, I needed three cut outs. Other models may take more. My continue tracing, comparing, and cutting until the whole model is covered below the edge of the foam. Then cover it with one last piece of uncut foam. 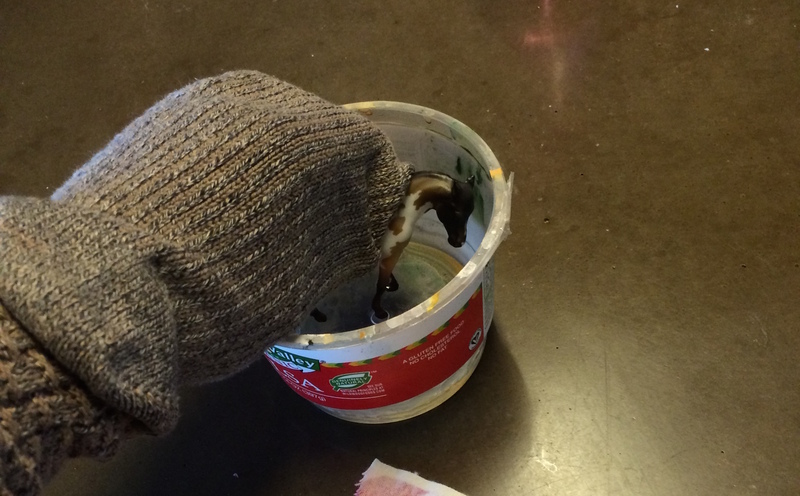 Add foam or other filler until you reach the height of the lid. You want the foam to be secure but not squished down. Put the top on, label it, and voila: your own custom carry case. 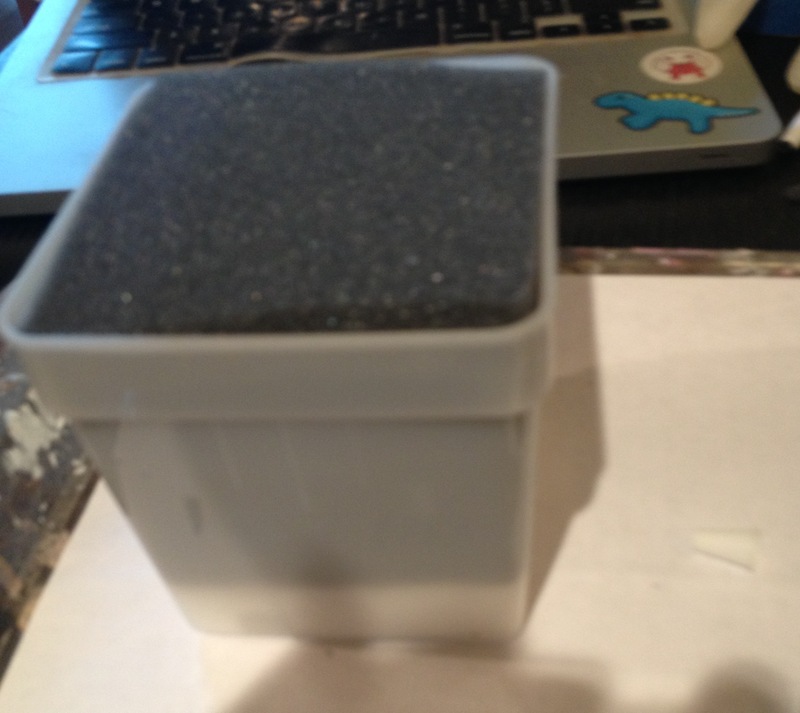 I opted to glue the first cut out into the container. 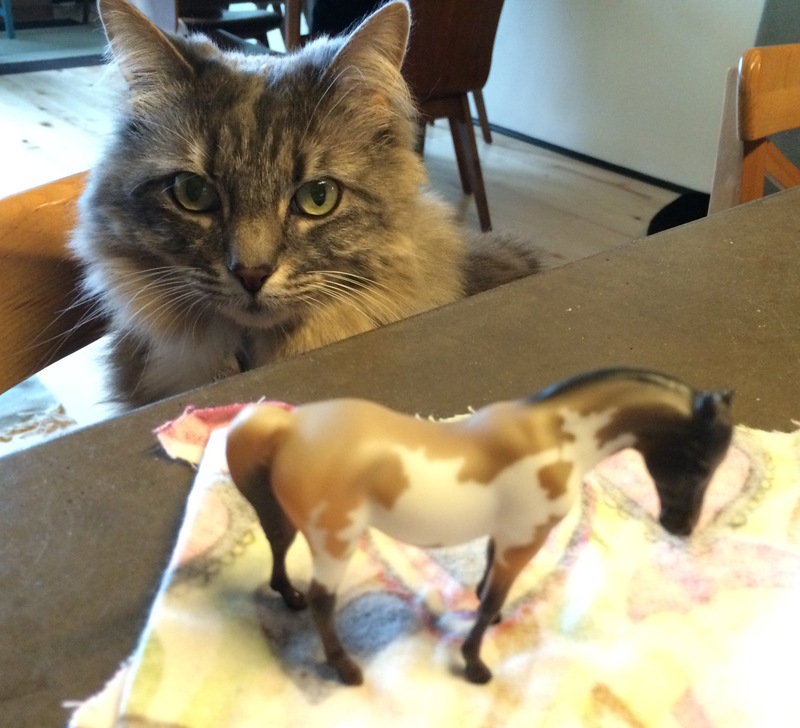 Be very careful not to get any glue where the model will touch! 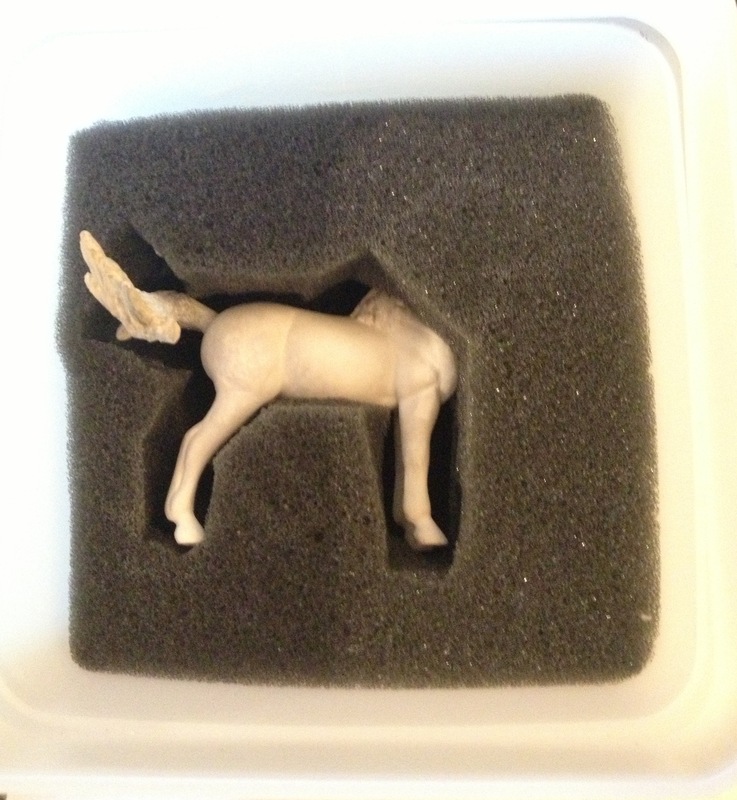 The other foam pieces are packed over the model and secured by the top piece and the container’s lid. 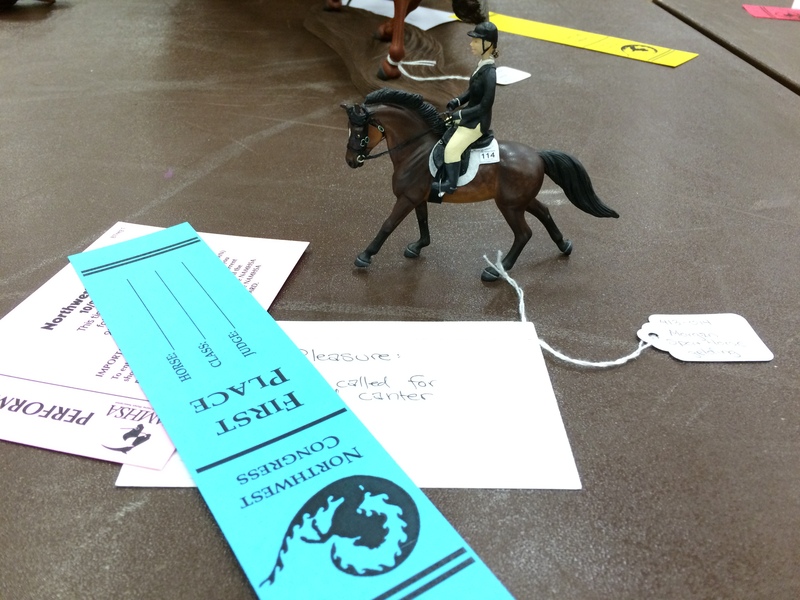 Alpo did not win any ribbons at Rose City Live. But he did travel safe and sound there and back! 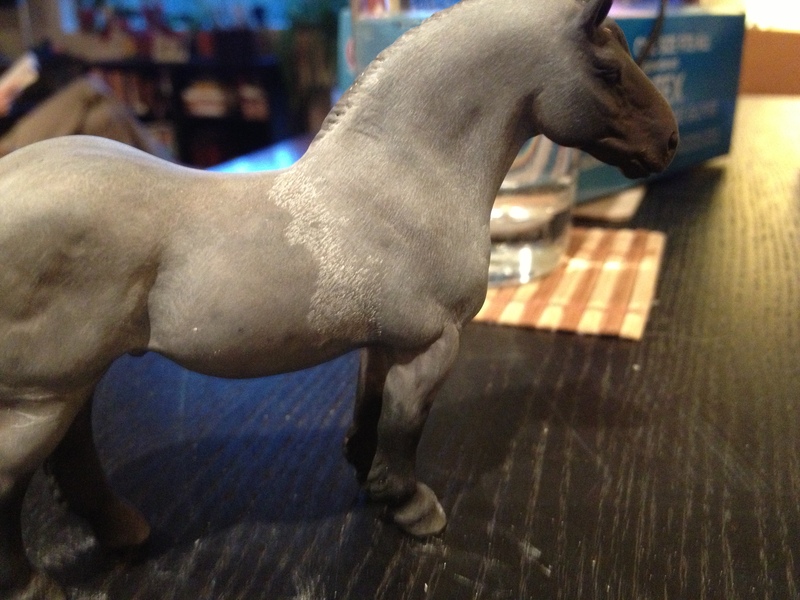 I had planned on painting my roan draft stallion using acrylic paint to do hair-by-hair roaning. But after a couple sessions, I really wasn’t satisfied with how it was looking. 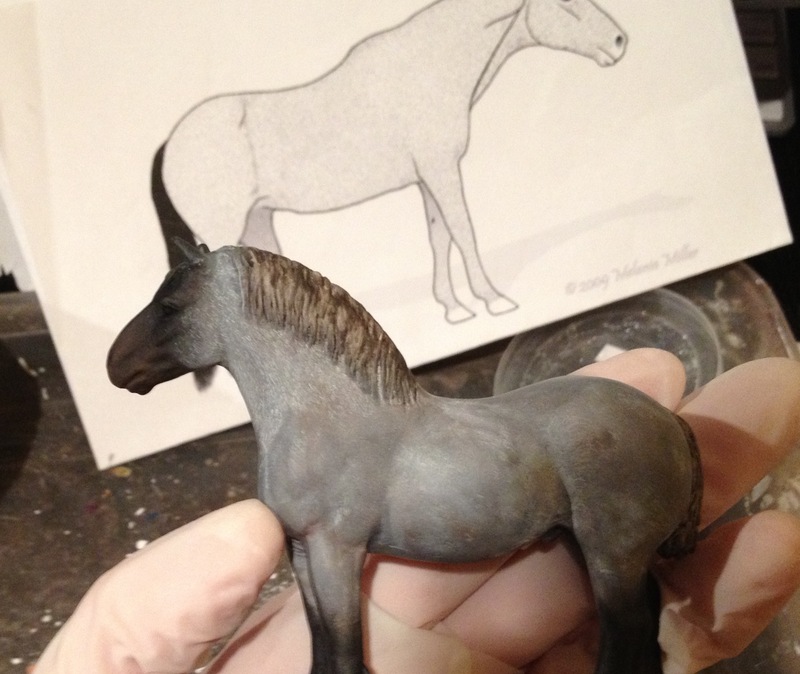 At the same time, I ran across part one of a nice roaning tutorial by Amanda Brock (Rogue Horse Studio) and Caryn showed me her first roan (done with a similar pastel technique) who was turning out quite nicely. 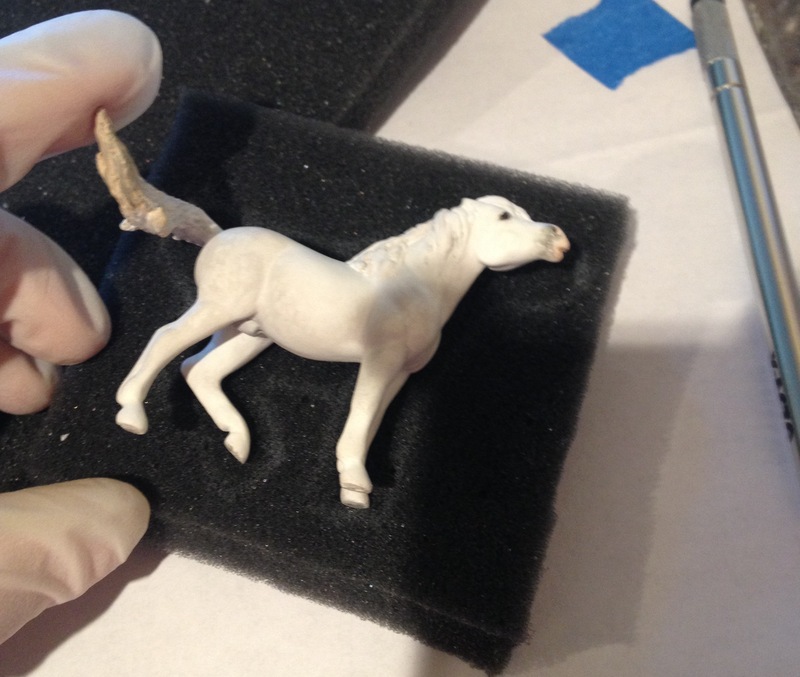 Caryn’s horse (in progress). Can you believe that’s her first roan? 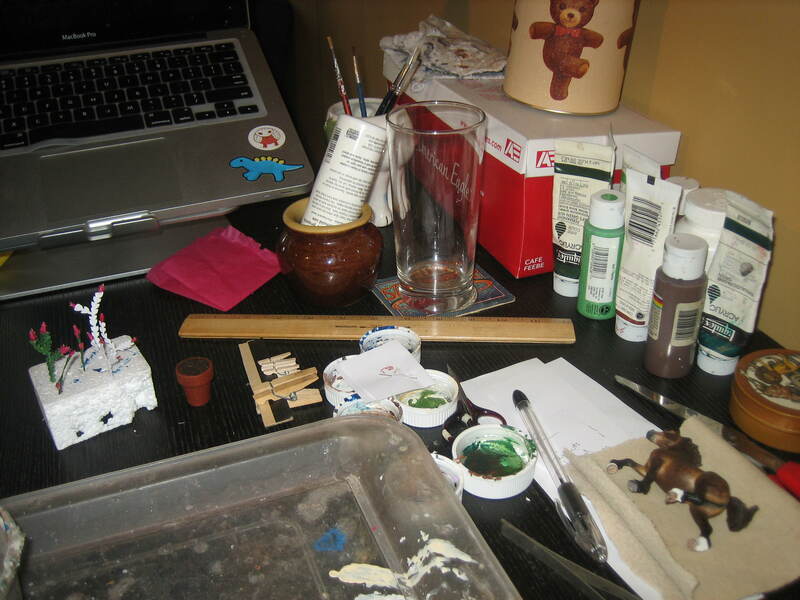 Inspired, I washed the acrylic roaning off my resin and started to work on him with pastels and pencil. He already had a sealed blue-grey-brown base coat, and I started in on some white pastel using Amanda’s stippling technique. I also added some hairing detail with colored pencils. I was all ready to start doing some serious hairing with white charcoal when I dropped him on the floor. Sigh. I was actually pretty lucky- all he lost was an ear. But it took me another few hours of work to get him whole again. 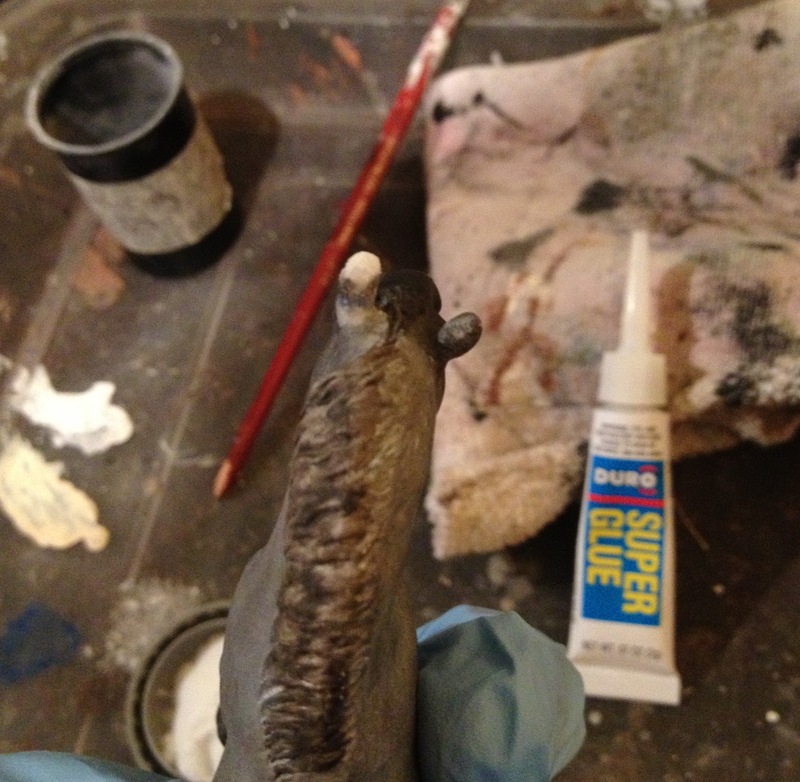 After shaping his new ear, it took a few coats of acrylic to get it somewhat matching again. Then finally, using my white charcoal pencil, I started adding individual white hairs. It’s crucially important when doing hair-by-hair roaning to a.) keep your pencil very sharp and b.) keep references handy. I’m using multiple hair growth charts (download them here) as well as close up pictures of flanks, armpits, and other tricky areas. 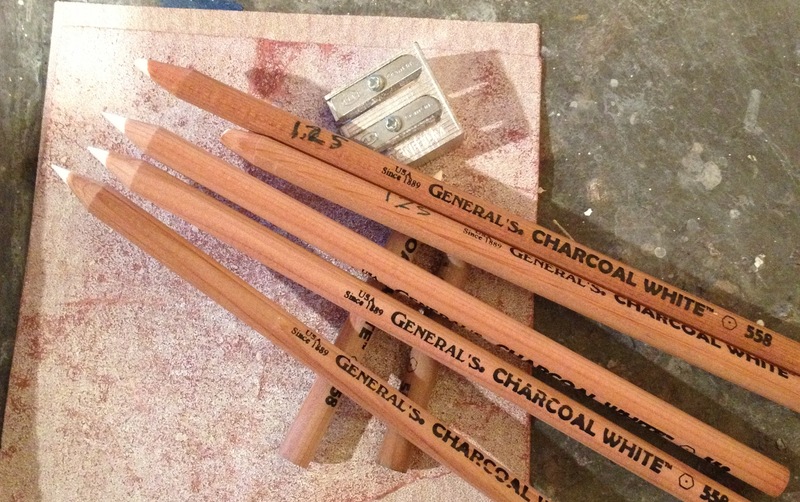 Keeping the pencil sharp enough to draw hairs on a stablemate scale resin requires a lot of sharpening. 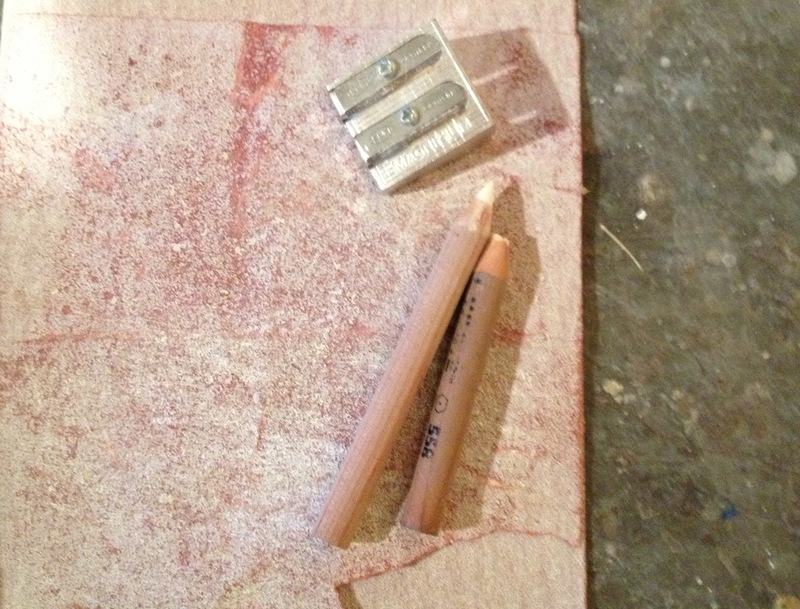 I used a regular sharpener plus sandpaper. You have to do it almost constantly, and that means you go through a lot of pencil. When I started roaning, I had two full sized pencils. Happily, there’s an art store within walking distance so I was able to pop out one afternoon and buy six more pencils to use. I’ve got a whole collection of nubbins now, but I’m done with the first layer of hair detailing. 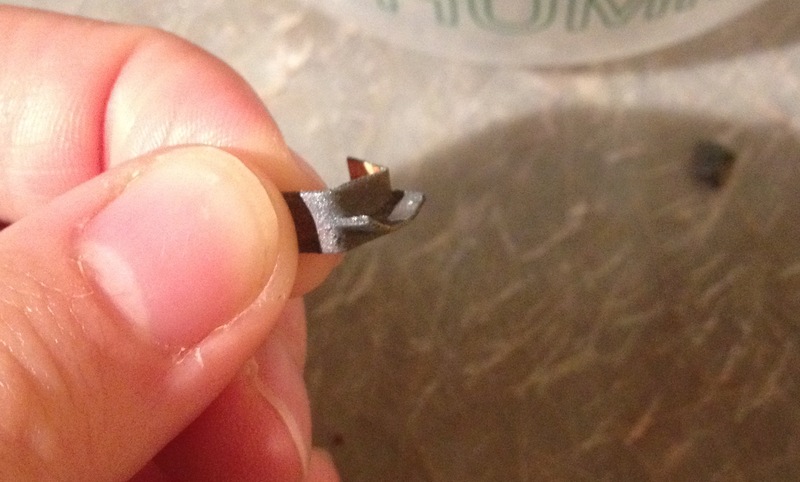 Even with all the sharpening, it’s basically impossible to get all the little hairs quite right. To keep things from being too stark, I go over each section with a medium-stiffness brush, keeping with the direction of the hair growth. It smudges the drawn hairs slightly and takes off any excess dust, which softens the detailing in a nice, more realistic way. I seal each layer with Dull Cote before moving on to the next. As with pastels, the sealer “pushes back” the color a bit which also helps prevent any stark lines. On his neck and shoulder, the hairs have been brush-softened and sealed with Dull Cote. The starker hairs on his barrel have just been drawn in with the pencil. I’ve been finding time to do a bit of work every night, and by today the first layer of hair-by-hair roaning is done. I need to do a bit more blending in some areas, but I’m going to give him a break for a bit so I can come back with a fresh eye. 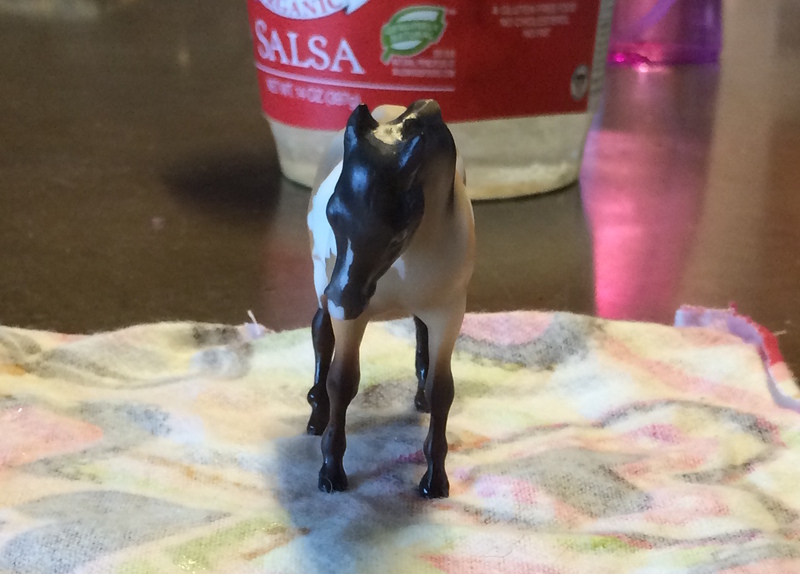 I also might work a bit on his acrylic details so I can better picture how his coat color will look on the finished horse. I’m still working on a name for him- I’d like to find something from French Brittany, since the Breton breed is from there. It’s an area highly influenced by Welsh and Gaelic language, which is always fun. This last weekend was my last free one before the holidays, so I took the opportunity to sit down and make some serious progress on the remaining hand made Christmas gifts. On the left you can see the mid point of a little project I did for my grandmother. 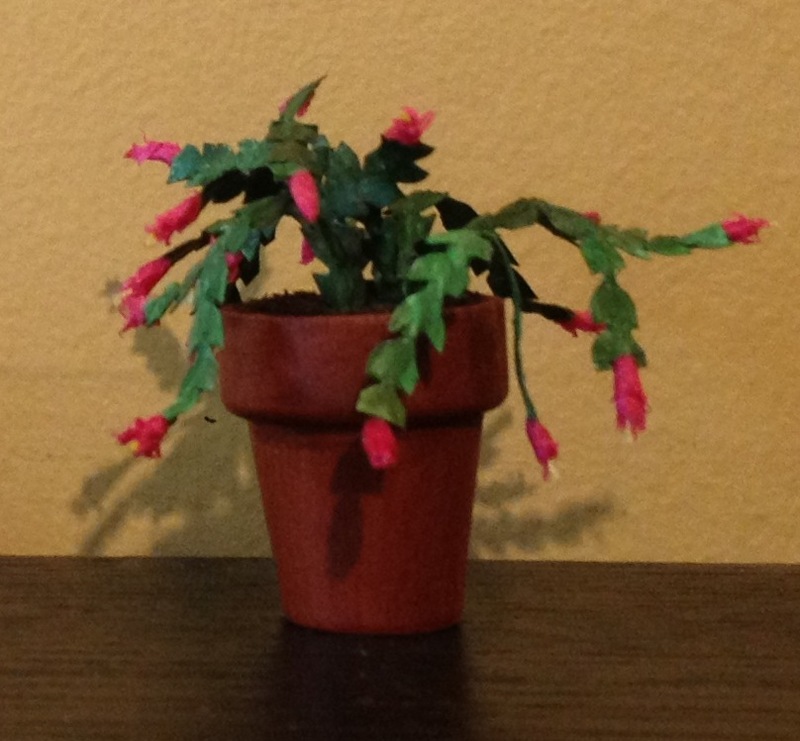 I used this cool tutorial from miniatures.about.com to make a miniature Christmas Cactus for her. It’s about 2 inches tall. 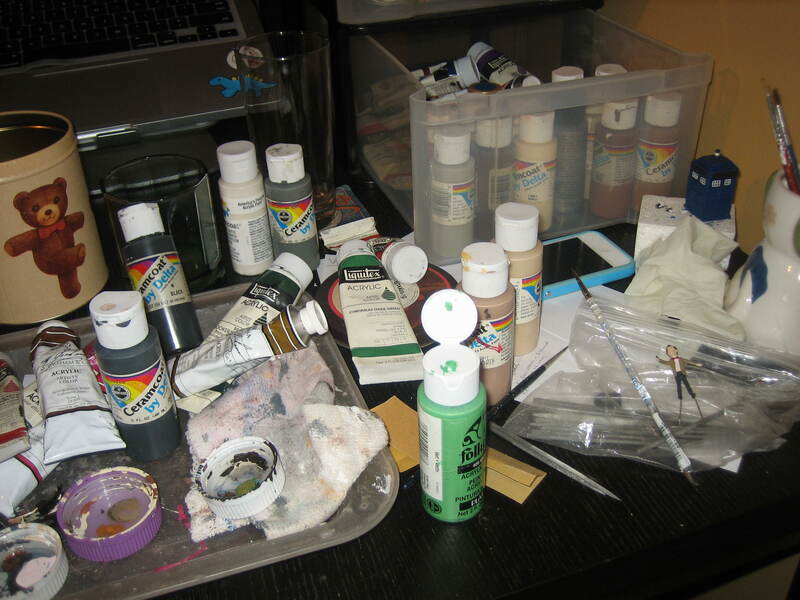 I loved the fact that I had all the materials already on hand from my other craft projects. 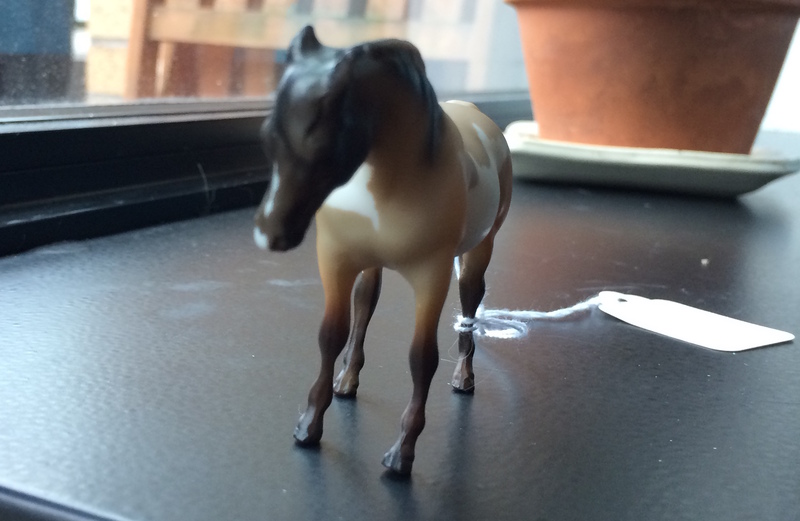 I learned some good techniques that will be applicable to the model horse hobby, too. 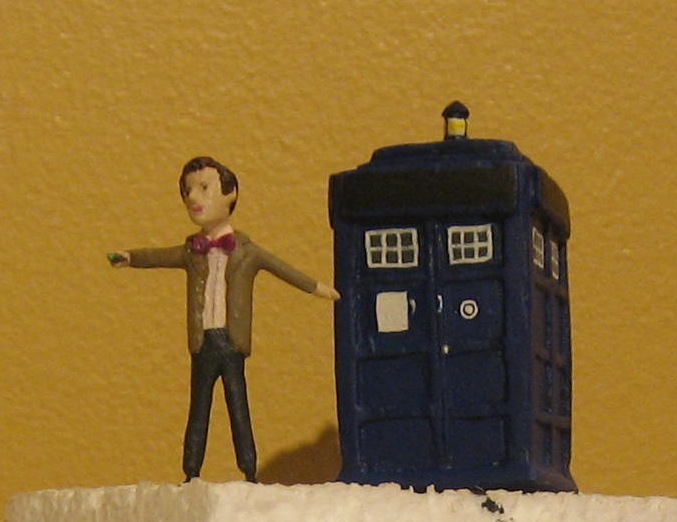 One of the ones that’s been haunting me is my 1:48 scale Dr. Who figure. 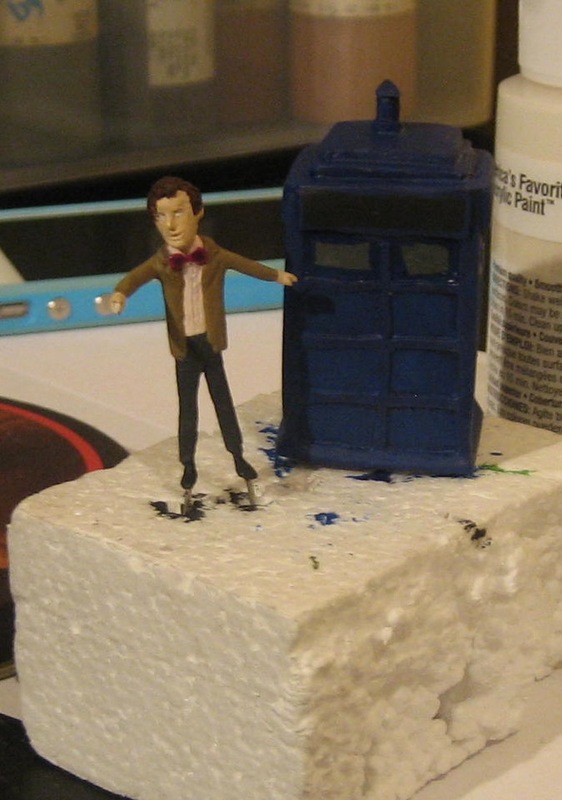 He and his TARDIS have been scary epoxy blobs for a while now, but no longer! They have taken shape, and with some paint they are looking downright delightful. And by Sunday, things were looking positively Who-tastic. 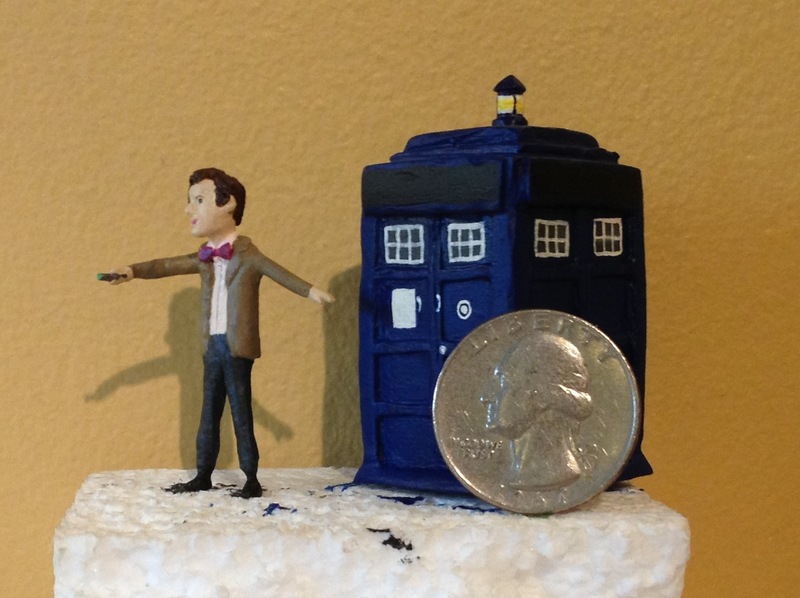 As you can see, I still need to do some miniscule writing on the TARDIS, but Sunday was coming to a close and I wanted to get some fixative on there before I do any more painting. I don’t know when that will happen, or if my eyes will fall out of my head, but I feel a lot better about having this done by Christmas! Did I mention he’s tiny?